India Kiosk Printer Market shipments reached 77.3 thousand units in CY Q4 2013. FUJITSU led the market. Growth of retail segment in India as well as rising consumers need for sophisticated services is driving growth of the India Kiosk Printer Market. Initially, Kiosk Printers were popular only in the field of POS, ATM and retail solutions in India. However, in the current scenario, their usage is far more spread across a broad range of functionalities including Education, Airline, Telecom, Transportation, Hospitality, Retail and Healthcare sectors. According to 6Wresearch, India Kiosk Printer Market shipments reached 77.3 thousand units in CY Q4 2013. FUJITSU registered the highest market share followed by EPSON. The Indian Kiosk Printer market is primarily dominated by printers with 384 Dots per line resolution with a market share of around 50%. Thermal Printing technology holds the highest share in theIndian Kiosk printer market as a result of the increasing usage of receipt and self-service check out stations. Further, Direct Thermal technology will continue to dominate the other technologies due to its low printing cost and ease in usage. 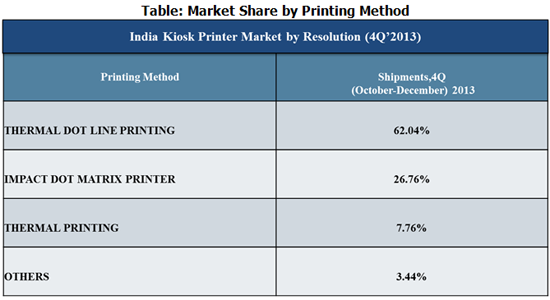 Source: 6Wresearch Quarterly India Kiosk Printer Market, CY 4Q 2013. Note: Others include Serial Impact Dot Matrix and Line Thermal printers. More than 16 vendors shipped Kiosk Printers. Out of the total Kiosk Printers shipped, approximately90% printers have weight less than or equal to 100 g.
In the effective printing area segment, 48 mm printers captured around 57% of the total market share. Connectivity options like USB and Centronics have broadened the range of applications for Kiosk Printers in the Indian Market. Additionally, Printers with USB connectivity bagged nearly 61% of the Indian Kiosk Printer Market.